Nice to read a follow-up on the stove. Even better to know you're still impressed with it. 1. Any significant smoking/odor until up to temp? 2. Are you buying high-purity kero or just the cheapo stuff? Around here (PNW) the quality stuff is available at some fuel docks, it's called Pearl oil. Boaters use it in their diesel stoves if they can get it, it burns very clean, but has a lower viscosity, so the metering needs to be modified. Thanks for keeping the blog going. I expect that although there may not be many comments, many are vicariously living the shantyboat dream through you and Morgaine's efforts. Hey Tom, nice to hear from you again. Regarding the Stove, there is very little odor at startup, just a tiny bit on first lighting. As for kero, we're using just regular fuel pump kerosene, and it seems to work just fine. These stoves are marketed rather heavily in the third world, and I'd imagine the quality of fuel may vary wildly from place to place. 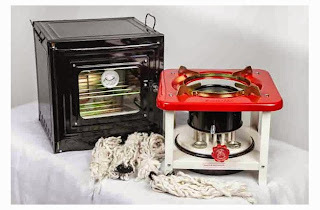 Unlike pressurized stoves like Diesel stoves, these wicked stoves can accept a wide viscosity range without a problem. Our stuff is dyed as well here in Md.